You will earn 864.00 bonus points. ? 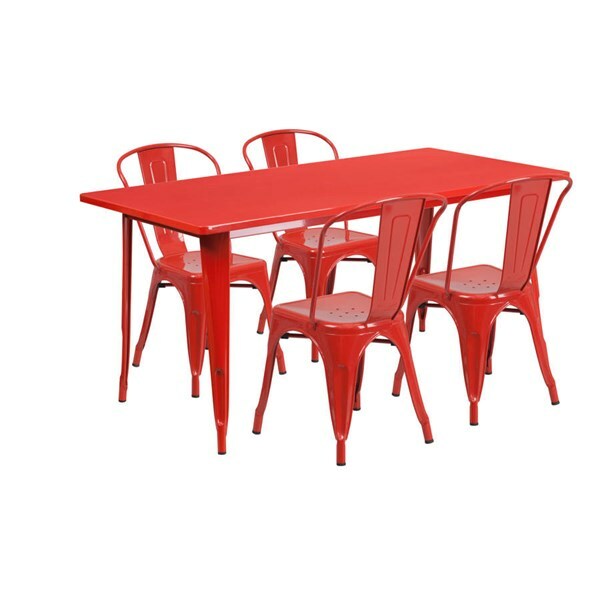 Complete your dining room or restaurant with this chic 5 piece table and chair set. This colorful set will add a retro-modern look to your home or eatery. The spacious rectangular table top features a smooth surface, a stabilizing brace and protective rubber floor glides. The lightweight stack chair features plastic caps that prevent the finish from scratching while being stacked. The frame is designed for all-weather use making it a great option for indoor and outdoor settings. For longevity, care should be taken to protect from long periods of wet weather. The possibilities are endless with the multitude of environments in which you can use this table, for both commercial and residential spaces. 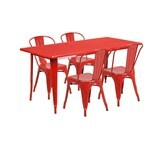 Included : Table and Chairs (4).